In March 2017, a trial excavation was conducted north of Nahal Barqan, along the southwestern fringes of Tel ʽEran (Permit No. A-7956; map ref. 202623-39/712877-90), after ancient remains were revealed in a pit dug for installing an electricity pole. 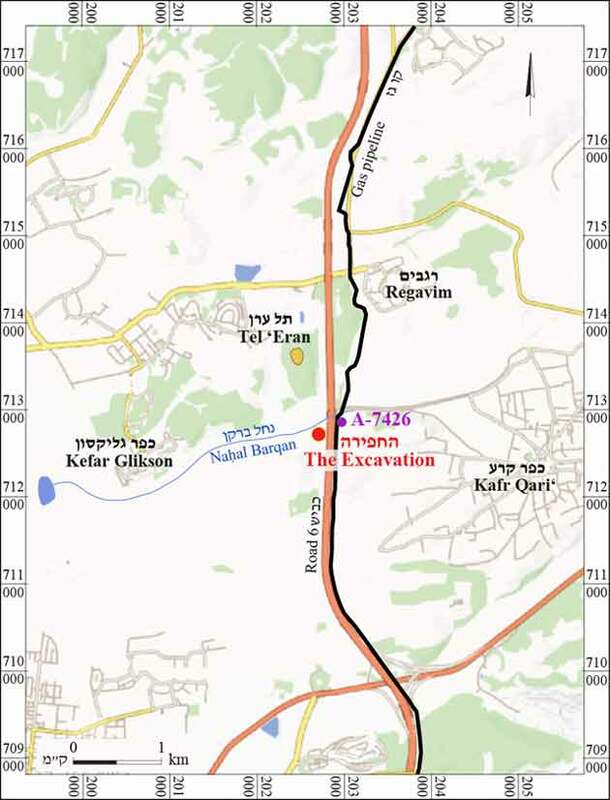 The excavation, undertaken on behalf of the Israel Antiquities Authority and financed by the Israel Electric Company, was directed by D. Kirzner (field photography), with the assistance of Y. Amrani and E. Bachar (administration), C. Ben-Ari (GPS), R. Mishayev (surveying and drafting), P. Gendelman (scientific guidance and pottery), Y. Gorin-Rosen (glass), U. ʽAd (consultation), M. Shuiskaya (pottery drawing), K. Saʽid and M. Massarwa. Tel ʽEran (c. 4 dunams) is situated in the southern part of Ramot Menashe, with its southern slope descending to Nahal Barqan. 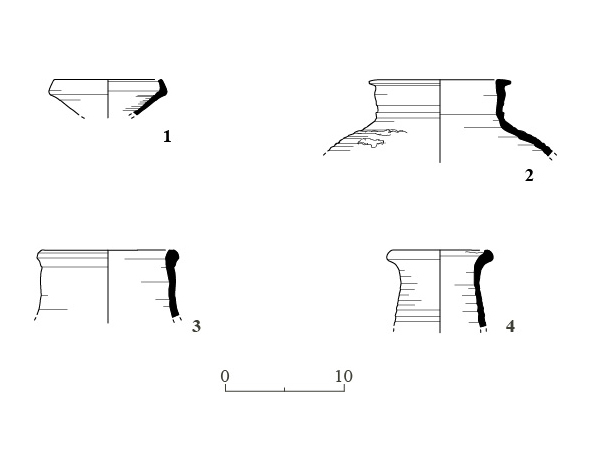 Previous excavations in the immediate vicinity revealed pottery sherds from the Neolithic period, tombs from the Chalcolithic period, a structure from the Iron Age and wall remains ascribed to the Byzantine period (Massarwa 2016, see references cited therein; Fig. 1: A-7426). 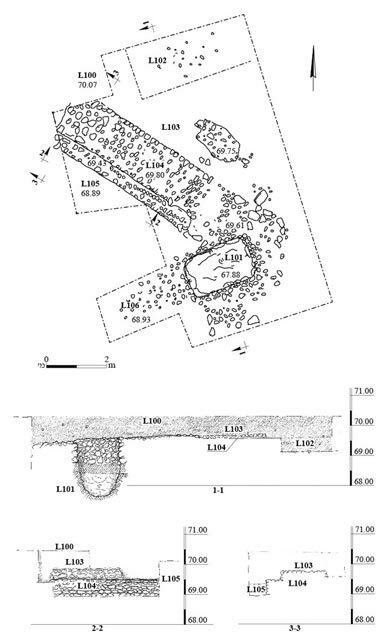 Two excavation squares were opened around the pit excavated by the electric company (L101; Fig. 2). 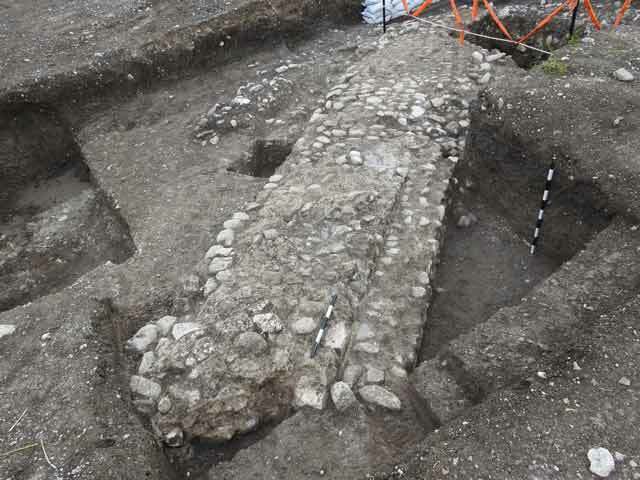 The remains of a massive foundation (L104; length 8.5 m, width 1.8 m, height 0.9–1.1 m; Figs. 3, 4), built of fieldstones and river pebbles (max. length 0.2 m) bonded with gray-white mortar, were discovered below a layer of brown alluvium (L100–L103, L105, L106; depth 0.6 m). Fragments of a bowl (Fig. 5:1) and jars (Fig. 5:2–4) from the first–third centuries CE were found in the alluvium that covered the foundation. Several glass vessels dated to the fourth and early fifth centuries CE were also discovered. 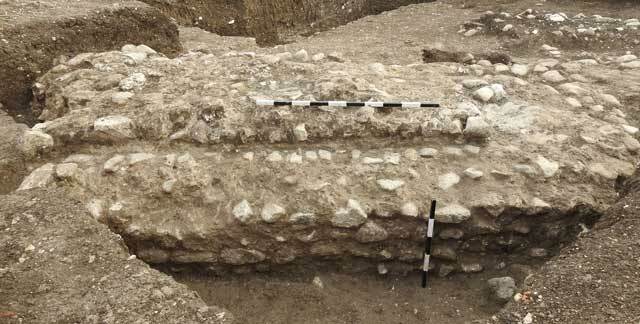 The foundation evidently carried a previously unknown Roman-period aqueduct. Massarwa A. 2016. Tel ‘Eran (Southeast).HA-ESI 128. 3. The foundation, looking southeast. 4. The foundation, looking northeast.